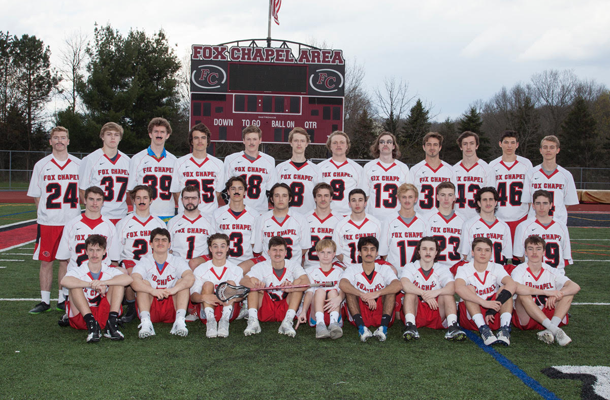 Boys’ lacrosse has been a WPIAL/PIAA sport at Fox Chapel Area since 2009, but this season stands out for many reasons, not the least of which is that the team earned the section championship for the first time. While advancing to the WPIAL playoffs isn’t new to the program ­– this is the fifth consecutive year they have headed into the postseason – it’s the first when they’ve made it past the first round. That feat occurred May 15, 2018, when the team disrupted Butler Area High School’s playoff dreams with a sweeping 15-8 victory. The dramatic win was highlighted by junior Zach Yonas’s eight-goal performance, but there are many more athletes who have contributed to the fun and success the team has enjoyed this year. Junior Reed Seybolt leads the team in assists, goals, and total points and sophomore midfielder Reed Troutman tops the group in ground balls. Junior defender Graham Childs, a Hofstra University-recruit, leads in takeaways and has eight goals – a great accomplishment for a defenseman. The coach also cites junior defensive midfielders Ty Welty and John Bozzone as having great years, as well as Jackson Boychuk, who’s had a breakout year in the net as a sophomore.